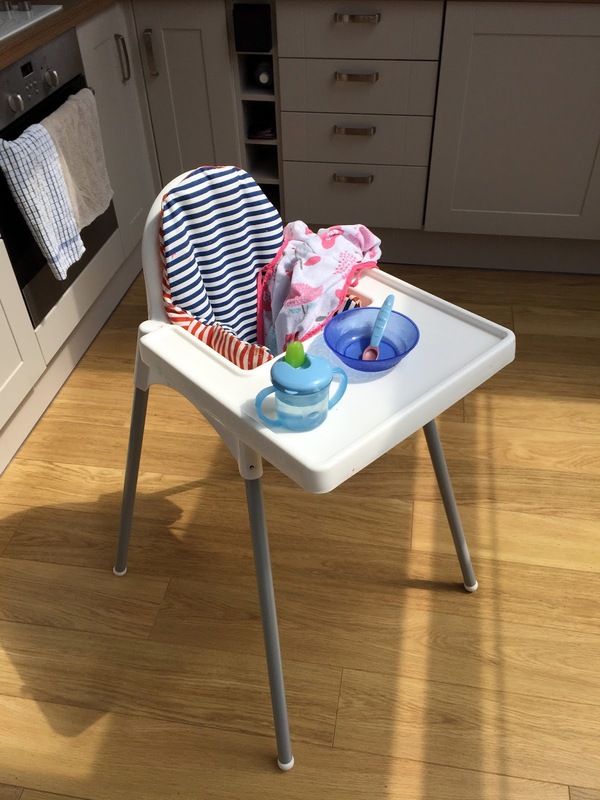 When I first began to plan weaning the baby I envisaged myself as the ultimate Annabel Karmel-Ella off of Ella's Kitchen SuperMama. The baby would be eating purees worthy of Masterchef champions. Only the finest, ripest, brightest fruit and vegetables would be purchased. I bulk bought designer bibs and designated entire cupboards to luminous coloured plastic bowls and spoons. 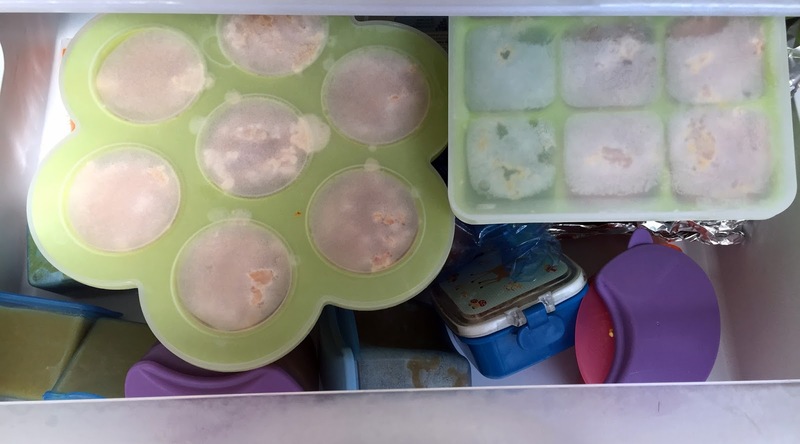 The freezer rapidly filled with carefully labelled, lovingly prepared miniature pots of weaning goodness. The freezer remains full of miniature pots. But I gave up long ago labelling them. Each mealtime we now play the very fun game of 'weaning pot roulette'. Bingo! Its pork casserole! Darn- Salmon Surprise* for the third supper running! I've discovered that there is a definite correlation between the amount of time earnestly preparing and cooking a delicious recipe and the refusal shown by the baby to eat said delicious recipe. I spent hours one afternoon cooking a fish pie to find the baby abjectly refusing to even entertain eating a single spoonful. The first month of weaning, any food that was tossed on the floor was immediately, without hesitation or deviation, unceremoniously thrown straight into the bin. By month two, it was three strikes and in the bin. Nowadays, I'm not entirely certain whether the carrot stick I've just returned to the high chair was from today's dinner... or last week's lunch. I still haven't worked out what is one prune too many. This, it turns out, is a careful calculus no less demanding than the mathematics required to launch a rocket to the moon. If I miscalculate, we need to pack a lot more nappies in the changing bag. And the mess. Oh, the mess. We are single handedly keeping the manufacturers of Varnish in business. But you know, it is a lot of fun. Seeing the baby's gorgeous little face scrunch up in delight (or disgust) as she explores new flavours and tastes. Watching her enthusiastic banging on the high chair tray, her little legs racing underneath, as I head to the fridge in search of her favourite: the coconut milk yogurt. I may not be the love child of Annabel and Ella, but the baby is enjoying solids very much, and that's all that matters after all. 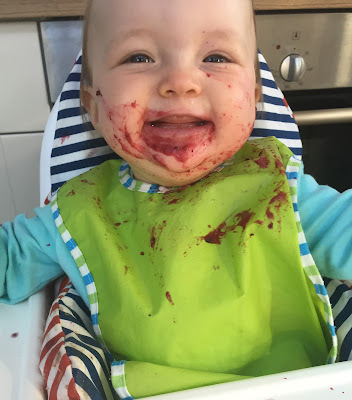 Great story - what a happy baby, must have been a non fish pie day! Yeah it happens... When we're preparing for something, we'll read about it, plan it to perfection and realize afterwards that it's not that big of a deal! But glad you came out with the roulette idea to keep things fun! At least your baby's enjoying it!